And it's all because their dog doesn't fit inside the standard Model S.
The Tesla Model S is many things, but dog-friendly isn’t one of them. In the UK, one owner has been struggling with the frustrations of trying to get their dog to fit inside their Model S. So they decided to take matters into their own hands and came up with a solution: convert the electric sedan into a shooting brake wagon. Its owner, Phil Hayton, has been documenting progress of the ambitious project, which is slowly starting to take shape. Hayton visited coachbuilders Qwest, a startup company based in Norfolk, UK, and tasked them to transform his four-door Tesla into a practical station wagon. Fully Charged’s Jonny Smith recently visited Qwest to see how the project is coming along. 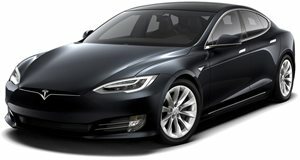 Tesla has yet to enter the shooting brake market despite wagons being hugely popular in the UK and Europe. As it happens, the design of the Tesla Model S lends itself well to a shooting brake as we’ve seen in artist renders – but turning it into a reality is an entirely different endeavour. There’s still a lot of work to be done, but the project is currently underway should be finished next month. Qwest even checked with Tesla to find out how to maintain support for the car and install software updates after the modifications. According to the engineers, the Model S shooting brake will weigh around the same as the original car, and the aerodynamics will be as good, or possibly even better than the standard Model S.